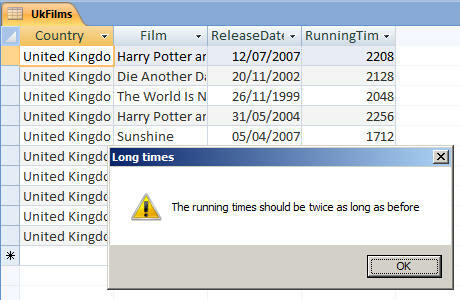 Try running the query called UpdateRunningTimes. You should find that it doubles the running times of all films in the table called UKFilms. In your existing module called modSimpleMacros, create another procedure called ChangeRunningTimes. Displays a message as shown below. Test that your macro works, then save and close your module.